Hello friends! I miss you! I'm sorry I haven't been around too much. I'm hoping things will slow down a little soon so I can be around more. 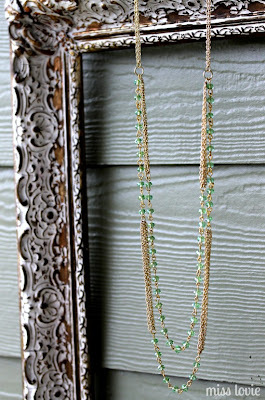 In the meantime, check out this fabulous necklace I just made! 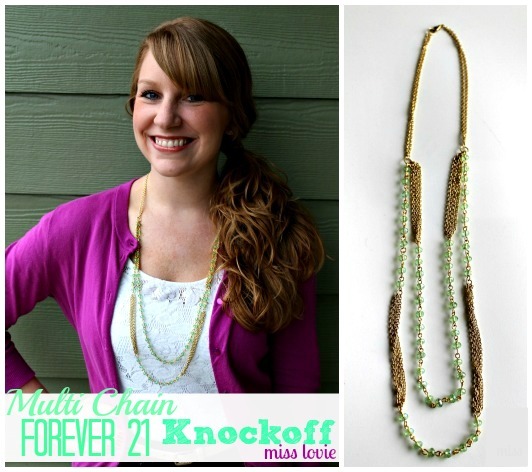 The Multi Chain Forever 21 Knockoff Necklace is great to wear with just about anything and I love the multiple chain look! 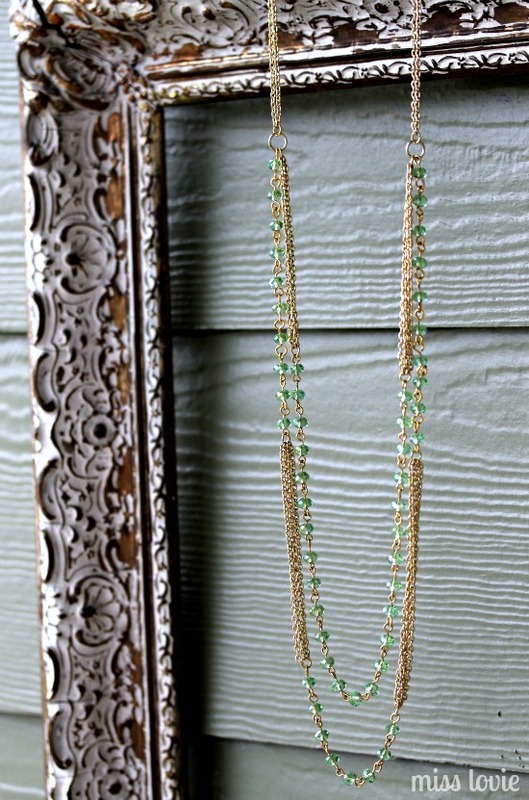 The tutorial is up now on 30 Handmade Days blog. I'd love to know what you think! Thanks for reading and we'll talk soon! Handmade Valentines for Kids-Eye Love You! I cannot take any credit for this cuteness. 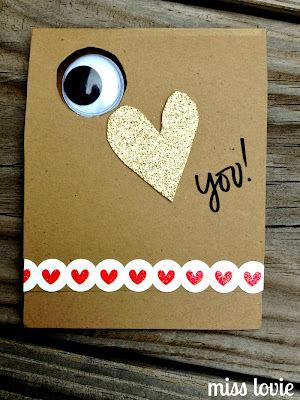 I first saw these I Love You Cards from the Kraze 4 Paper Etsy shop and pinned them immediately. They are so cute. I would have definitely just bought these, if I had thought about it early enough. 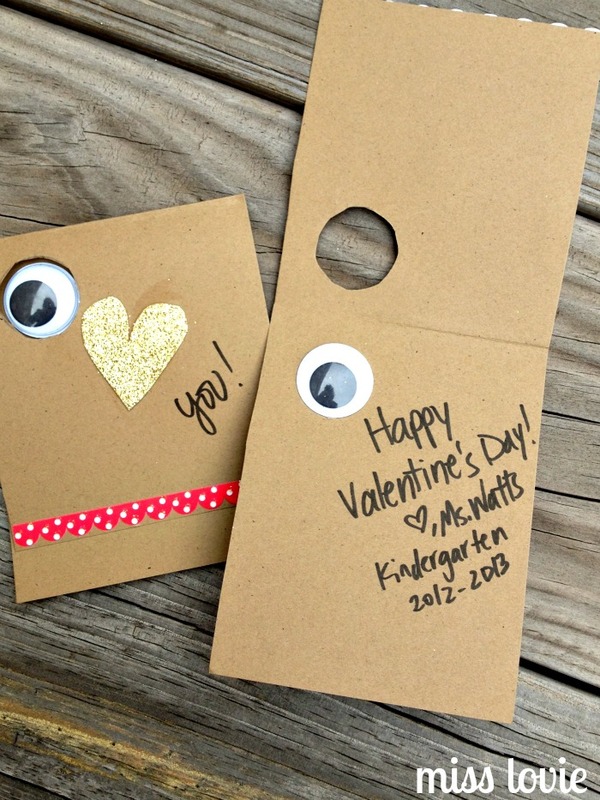 Instead of planning ahead, I didn't think about what I would do about valentines for my kiddos until the day before. Oops. So around 4:00 (before I left school) I tried some printables from my Valentine's board on Pinterest, but our color printer was acting up so that idea was out. Then I came across this idea I'd pinned forever ago. 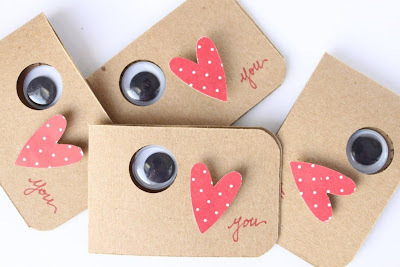 I knew mine wouldn't be as great as the original, but I grabbed some jumbo googly eyes from my classroom closet and took them home in hopes to recreate the idea somehow with whatever else I could come up with at home. Of course, I didn't even start to make them until 10:00 that night. Ha. I was tired, but they got done and the kids LOVED them today. What did you do for valentines this year? 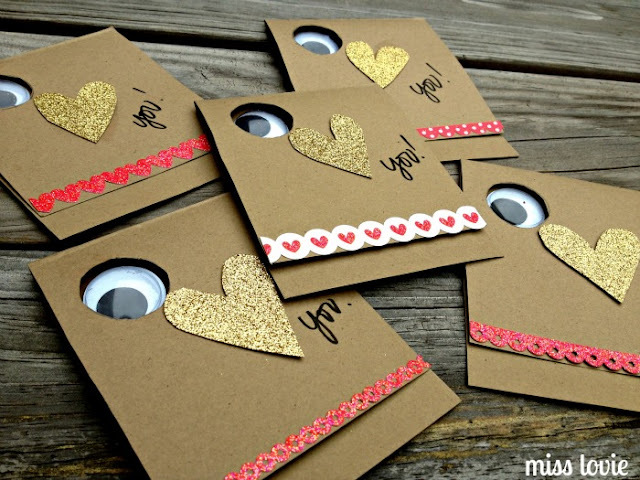 Go handmade or store bought? I'd love to see your ideas! Leave your link in the comments and I'll check it out! I know I'm really late in posting any Valentine projects, but I couldn't not post it. :) I have had this wreath mostly done besides the hand embroidery for the past week and a half, but have had a hard time finding the time to finish it! I've been trying to narrow down some vendors for my wedding and, of course, at school. I hope you know I would definitely rather be blogging! So this wreath was so super fun to make. As soon as I saw this Scallop Felt Ghost Wreath by Tatertots and Jello, I just knew I had to make a wreath using those felt scallop strips. SO cute. I thought it would be fun to add in some extra color besides just my usual go-to color for valentine red. I love how the color blocking turned out and the scallops are precious. The various garlands were so fun to make, too. Cuteness. If you'd like to make one too, follow along! Cover the wreath in scallop strips. 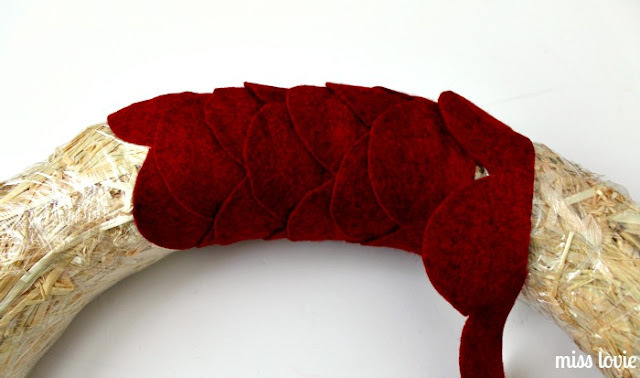 Cut felt into strips and then cut out scallops using the template. You can print the template onto card stock, cut out tape together and it creates a long scallop strip about 25 inches long. Pin the strip to a couple or 3 strips of felt at a time and cut around the template. 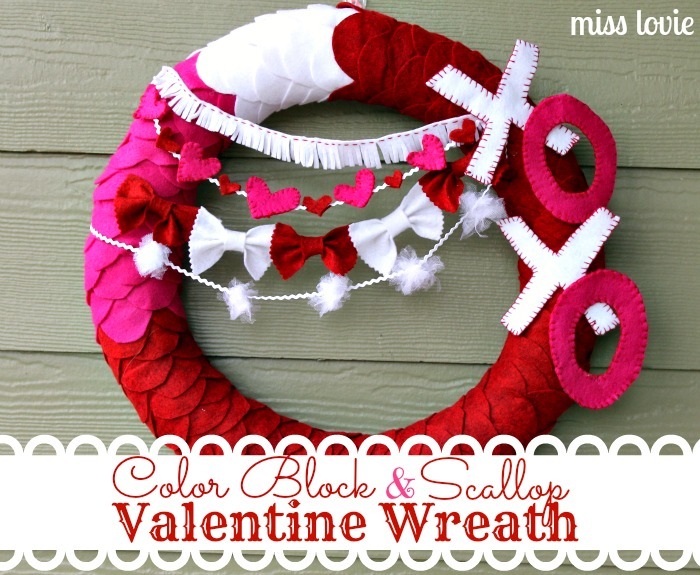 Once strips are cut, start wrapping red scallop strips around the wreath form, making sure entire form is covered and scallops' hills and valleys are alternating. Use hot glue to secure. 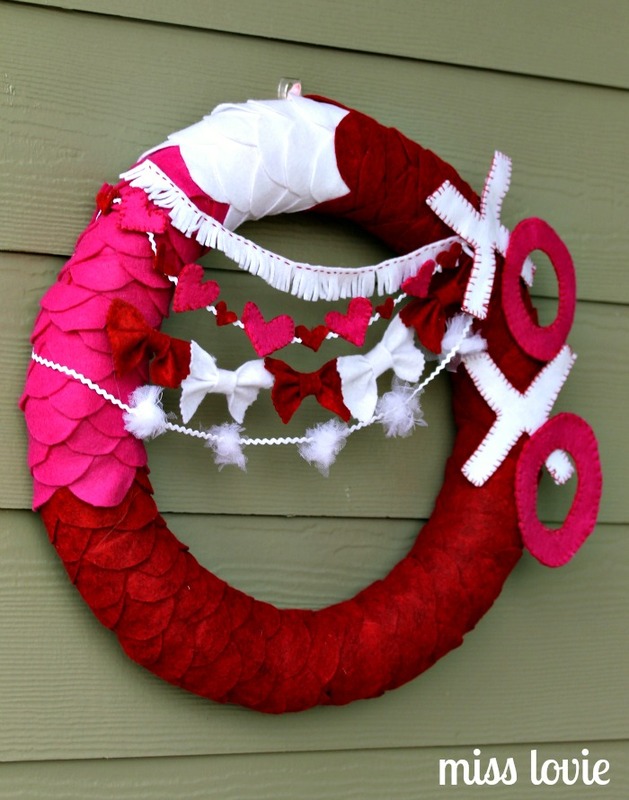 Cover about 3/4 of the wreath in red scallops. Cover about 3/4 of the remaining portion of the wreath with pink and then cover the remaining portion white. To end the wrapping part, tuck the flat end under some scallop hills and valleys and glue to secure so you can't tell where the end is. 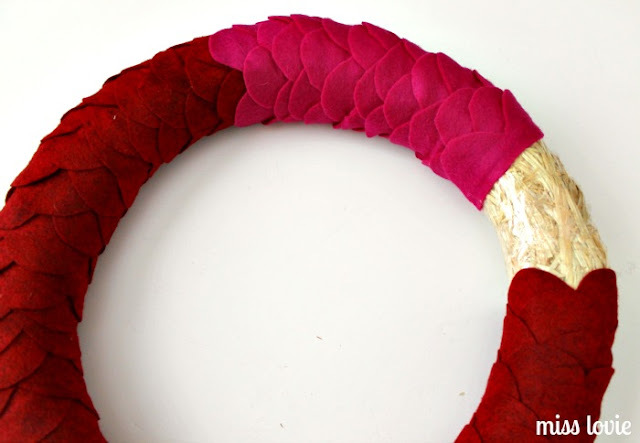 Create garlands and attach to wreath. 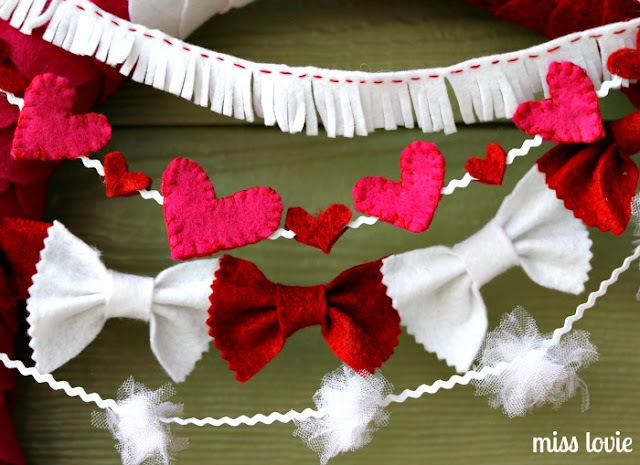 To create the simple heart garland, just cut out hearts from two pieces of felt at a time to get matching hearts. hot glue one of the matching hearts under the ric rac and then the other matching heart on top. Continue until length of ric rac is full. I alternated Large pink hearts that I later embroidered using a blanket stitch and smaller red hearts. To create the tulle pom garland, cut a 10 by 6 inch length of tulle (I like to use these tulle rolls you can find at Hobby Lobby). 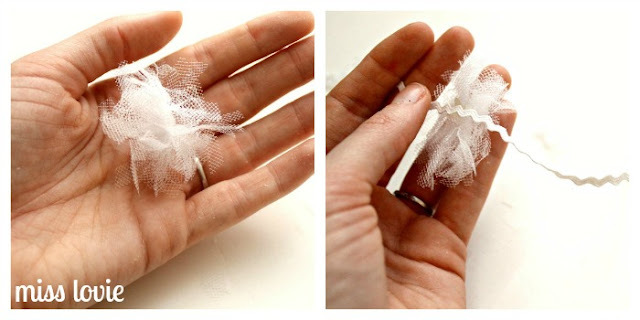 Fold the tulle over itself three times and then up again once. 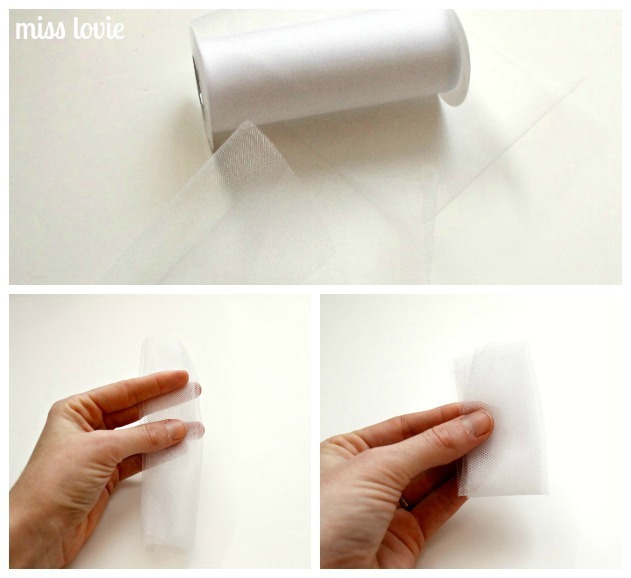 Cut all the edges off the folded tulle to create a stack of tulle strips. Use a matching piece of thread to tie a knot in the center of the strips. Cut lengthwise cuts into the tulle up to the tied center on both sides. Trim the ends to make the tulle more square and ready to be fluffed into ball form. Fluff the tulle into a ball. Fold the tulle ball over ric rac and secure wit hot glue. Continue for entire length of ric rac. 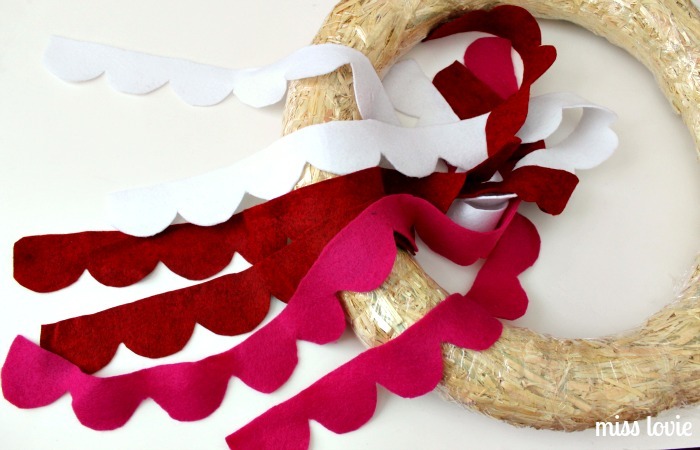 The fringe garland should be pretty self explanatory-simply take a strip of felt and cut tiny vertical cuts into it all the way across. I used a running stitch across the top of this garland. 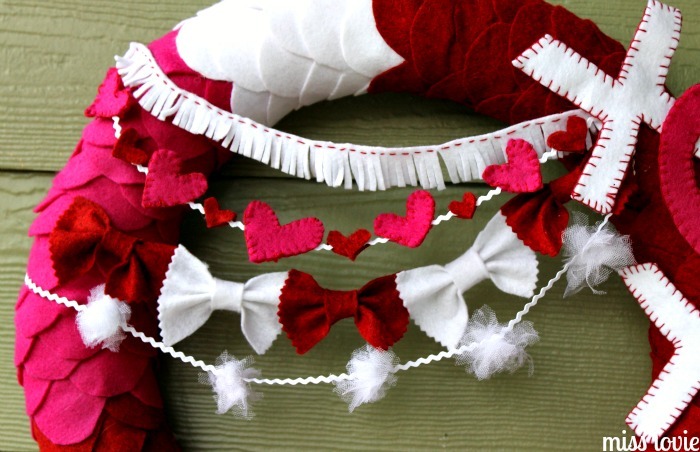 The bow garland was simple, too, and I did not take pictures. 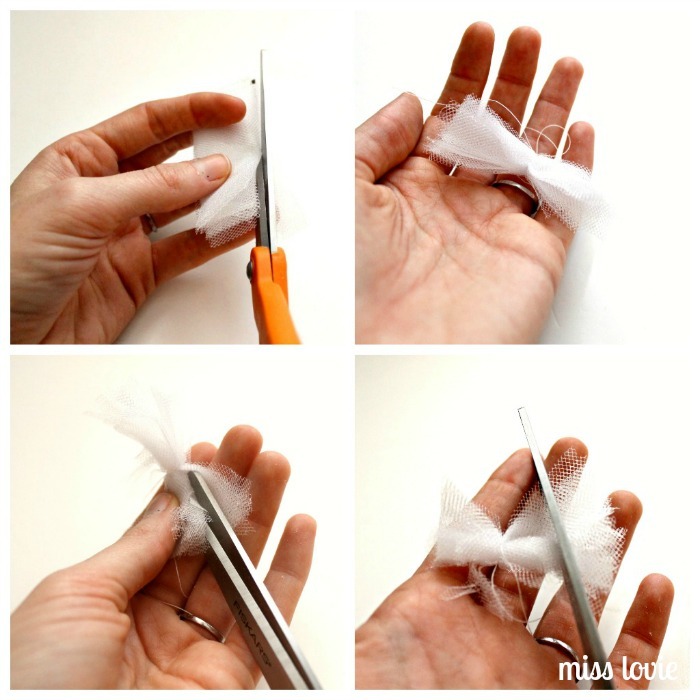 Simply make felt bows by cutting rectangles. Fold rectangles like a fan and then use a tiny rectangle of the same color felt to bind the fanned felt in the middle. Trim the edges with pinking sheers. Make enough bows (the same size) to create a garland. Glue the corners of the bows together with hot glue. 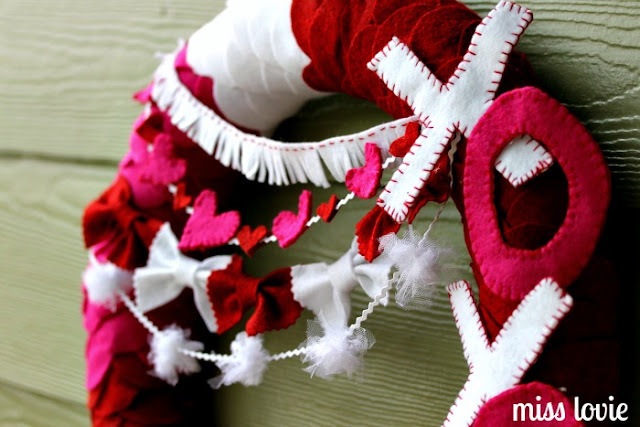 After all the garland is glued on, cut out some Xs and Os from felt (2 pieces per letter) and use a blanket stitch around the edges to secure the pieces together. Simply hot glue the letters on top! 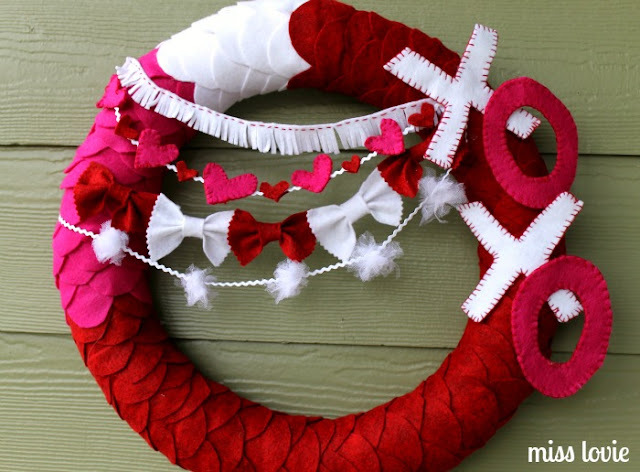 I hope you enjoyed this Valentine Wreath tutorial!! 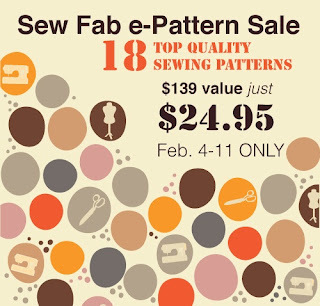 Sew Fab e-Pattern Bundle Sale and Giveaway! I am so excited about this pattern sale! I just bought mine and I am so impressed with these patterns! 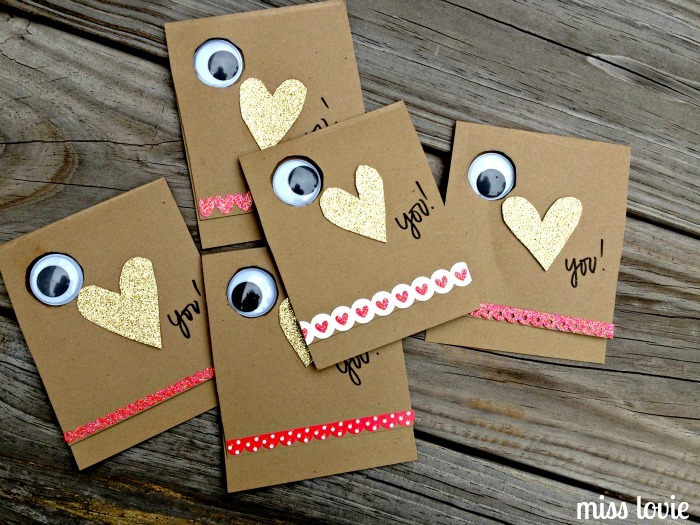 They are full of pictures and detailed instructions and all the projects are so fun. I can't wait to sew some of these up this week hopefully and I'm sure I'll be using them for quite awhile! Read on to find out more about this bundle. Giveaway is at the end of the post! Soooo...next week I have something extra fun going for you! Read on to find out a little more..I'm so excited! 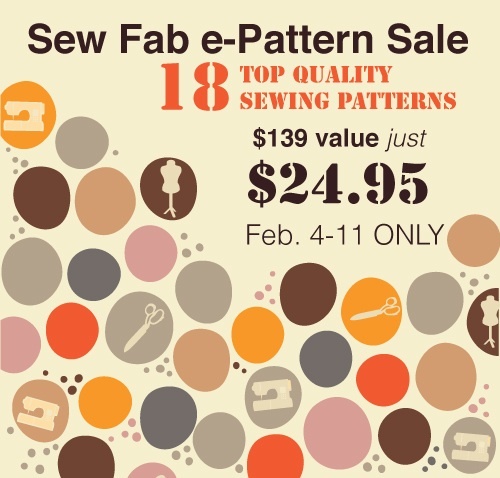 For one week only, ten pattern designers will be joining together to combine 18 of their best PDF sewing patterns (valued together at over $139.00) and selling them to you for the incredible price of $24.95! That's over 80% off of the combined retail value! That wasn't a typo! For less than $25.00 you will have the chance to purchase a library of resources to get you started on several great projects that you can sew over and over again. The designers that are joining this sale are experts at their craft. They have been sewing for a very long time and are well known in blog land as well as in children's and women's sewing pattern design circles. Each designer has contributed one or two of their favorite sewing patterns to create a bundle that is sure to please! Whether you are sewing for your own family or making gifts for others, these are patterns that you will love to use. Figgy's Patterns, Go To Patterns, peek-a-boo pattern shop, Seamingly Smitten, One Girl Circus, Sew Much Ado, luvinthemommyhood, Gingercake, Sew Fearless, Me Sew Crazy... this is the lineup! But you have to wait until Monday to find out exactly which sewing patterns are included in the pattern bundle. I can tell you that you won't be disappointed! We are offering an affiliate program for this amazing sale too! If you think your blog readers, Facebook friends, or Twitter pals would be interested in buying this bundle of sewing patterns, why not sign up as an affiliate? 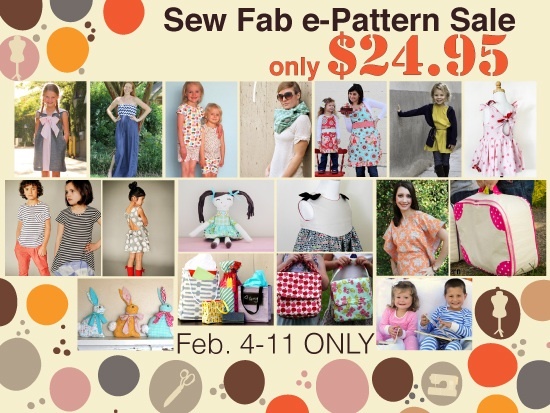 As a Sew Fab Sale affiliate you can sell the pattern bundle on your blog and earn 40% of all of your sales! 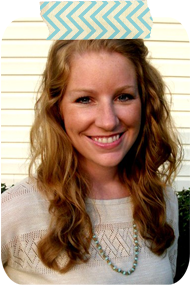 Contact Jenny at thesoutherninstitute@gmail.com for more details! Aren't you guys so excited!! This is such a crazy deal for all these wonderful patterns. I can't wait to try them out!